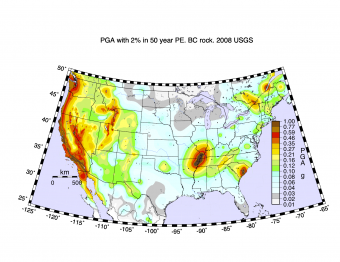 How can you model earthquakes in the classroom? Mechanical model of the earthquake process using a wood block, sandpaper, and rubber bands to show how "Forces, Faults, and Friction" interact as elastic energy is slowly stored as the rubber back stretches. 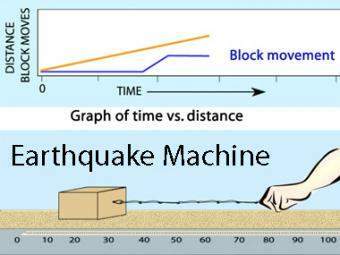 Then releases an "earthquake when the block overcomes friction. This block-and-sandpaper model can be used to teach the concept of elastic rebound and how energy is stored and released. Earthquakes can provide a useful context for teaching or reviewing many basic physics concepts, such as sliding and static friction, forms of energy and conversion from one form to another, and the elastic properties of different materials. Block-and-sandpaper model can be used to teach the concept of elastic rebound and how energy is stored and released. Basic physics concepts include sliding and static friction, forms of energy and conversion from one form to another, and the elastic properties of materials. Students collaborate in small groups to investigate how energy is stored elastically in rocks and released suddenly as an earthquake (the earthquake cycle). 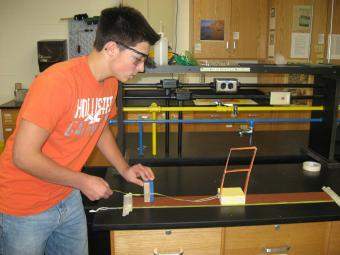 This activity emphasizes the role of mechanical models in understanding and testing ideas in science. Earthquake Hazards: Next big one? In this activity, students explore of the concept of probability and the distribution of earthquake sizes, and then work to understand how earthquake hazards are described by probabilities. Students then work in small groups to collect and analyze data from a simple physical earthquake model and use online data to investigate and compare the earthquake hazards in California and Missouri. This demonstration shows that rocks are elastic by squeezing a slit core of rock. 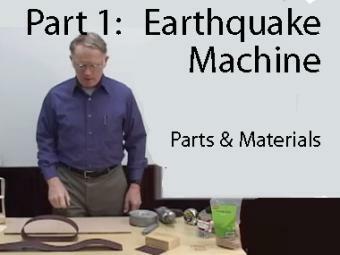 This video shows how to build the "Earthquake Machine", a physical model that represents the “earthquake cycle”, the slow accumulation of elastic energy in rocks on or adjacent to a fault followed by rapid release of elastic energy during an earthquake. 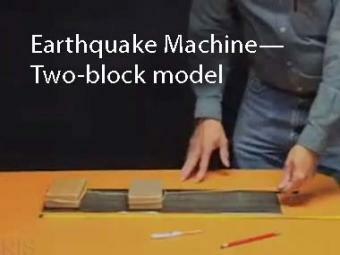 THE two-block "Earthquake Machine" uses two blocks with different grit sandpaper to model interactions between adjacent patches along a fault. 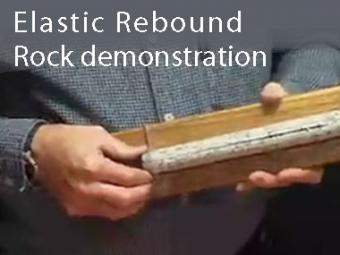 Animation of the single-block "Earthquake Machine", a mechanical model of the earthquake process using a wood block, sandpaper, and rubber bands. This model shows how "Forces, Faults, and Friction" interact as elastic energy is slowly stored when the rubber back stretches and then is rapidly released as the block jerks during an "earthquake".